As long as David Goodwillie isn't phased by playing four matches under the same manager, I reckon Dundee United's prodigal son is ready to relaunch his previously blossoming career. Of course, the revolving door to the gaffer's office at Blackburn Rovers - there have been four different occupants in the two years since Goodwillie swapped Tannadice for Ewood Park, not to mention his loan spell at Crystal Palace - is only part of a frustrating football story. Frustrating because this is a 24-year-old striker blessed with an uncanny talent for scoring goals and he should be doing it regularly for club and country. Hopefully for Goodwillie, United and Scotland, his first Scottish Premiership goal in Saturday's 4-0 defeat of St Johnstone will give him the kick-start he so badly needs. He found the net 40 times in his first spell at Tannadice courtesy of that instinct to be in the right place at the right time, coupled with the killer touch to snap up those scoring chances. Goodwillie's played three times for the national team and there's no doubt manager Gordon Strachan would love a reason for a recall; the squad's not exactly overstocked with top strikers. But it has to be one step at a time for a player whose football development has been derailed. There have been too many distractions, too many Goodwillie stories which had nothing to do with sports reporting. I think he's in the right place to get back on track. A familiar football club and a smart manager in Jackie McNamara. It's a temporary Tannadice return. An extension beyond January would depend on Blackburn not wanting him back and United being able to afford to keep him. 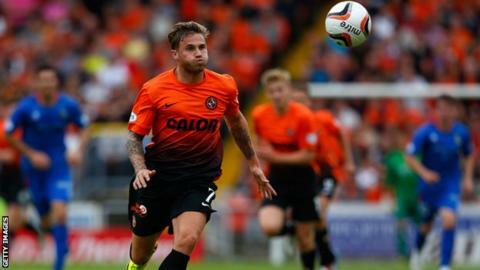 And a continuing loan arrangement would also hinge on Goodwillie delivering the goods in the next few months. He needed that goal against St Johnstone as he's been snatching at chances in his anxiety to reopen his account. Now that's done, Goodwillie can settle down, in all sorts of ways, and earn himself some happier headlines.